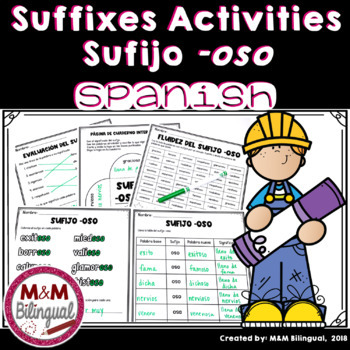 Looking for an engaging way to help your bilingual students master suffixes? 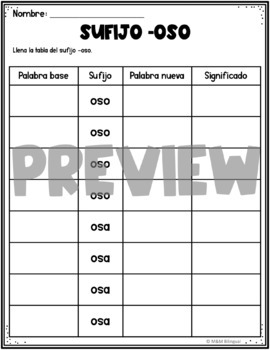 This resource focuses on one common suffix found in Spanish. -1 anchor chart to help introduce the suffix to the students. Teacher can post this and students can glue in their interactive journal. -1 brainstorming page. Students can use 2x2 post its to add words they already know (prior knowledge) that contain the suffix or add new words to the page as they learn and master them. -3 interactive journal pages. Students can complete these in small groups, centers, guided reading groups, word work, or independently and glue in their interactive journals. -1 suffixes and definition game. Students can play a memory game with these cards or cut and glue matching cards in their journal. -1 assessment page focusing on the suffix they’ve practiced. Includes: matching, fill in the blank, and a sentence using the words. Please see the thumbnails above to be certain this product fits your classroom needs. If you have any questions, send me a question prior to purchasing through the Q&A tab on this page and I will get back to you ASAP. Looking for a similar activity for Spanish prefixes? CLICK HERE >>>> Trabajando con prefijos BUNDLE! I hope you and your students enjoy these activities. Feel free to tag me on Instagram @mmbilingual with my products in action in your classroom. I would love to feature you!